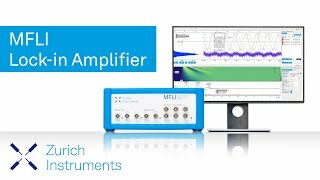 The Zurich Instruments MFLI is a digital lock-in amplifier that sets the new standard for measurements in the medium and low frequency range. The MFLI is available in two versions covering the frequency range DC to 500 kHz and DC to 5 MHz (an upgrade from 500 kHz to 5 MHz is possible later). With the carefully developed analog and digital front ends in combination with the merits of fast digital processing provided by the on board FPGA, the MFLI combines superior performance with the outstanding LabOne® toolset. The embedded data and web servers allow straightforward connection to any device running a web browser. LabOne toolset: Scope, Sweeper, Spectrum Analyzer, etc. No, all options are firmware and software based and can be upgraded at any time later in the field. The MFLI has an embedded web server and can be connected to a local network where it can be accessed from any web browser by opening the address "http://mf-dev3XXX". How does the MFLI compare to HF2LI and UHFLI with respect to key features and specification? Please see the comparison chart. This option extends the frequency of 500 kHz MFLI lock-in amplifiers and 500 kHz MFIA impedance analyzers to the frequency range of DC to 5 MHz. The upgrade is enabled on the instrument by a software key and does not require any hardware changes or return of the instrument. Also, the installation can be carried out at any later point in time. The upgrade is independent of the option set installed and does not affect any of the other instrument specifications, only the available frequency range for the oscillators. The Zurich Instruments MF-IA is an upgrade option for the MFLI lock-in amplifier. It provides the full digital impedance analyzer and precision LCR meter functionality that sets the new standard for impedance measurements in the frequency range from DC to 500 kHz / 5 MHz. With the MF-IA option installed impedance can be measured with 0.05% basic accuracy and a measurement range spanning from 1 mΩ to 1 TΩ. The instrument has a high measurement repeatability and a small temperature drift. The AM/FM modulation option allows generation of phase-coherent linear combinations of up to 3 oscillator frequencies. The direct measurement of (higher-order) sidebands in a variety of different modulation schemes, including amplitude modulation (AM) and frequency modulation (FM), can be conveniently set up in the LabOne® user interface. Unlike conventional double demodulation schemes, e.g. The 5 MHz version of the instrument is offered as a bundle containing the MFLI 500 kHz plus the MF-F5M Frequency Extension with a more attractive price than buying the items separately. Please note that the special pricing is offered only when the two items are purchased with a single purchase order referring to a single quotation. Voltage measurements and current measurements are both supported by the base instrument, but the simultaneous measurement of current and voltage requires the MF-MD Multi-demodulator option. The analog front-end features variable input impedance as well as AC/DC coupling selection and the high-frequency analog to digital sampling provides a large over sampling factor, ensuring superior lock-in performance and high signal fidelity for the Scope. 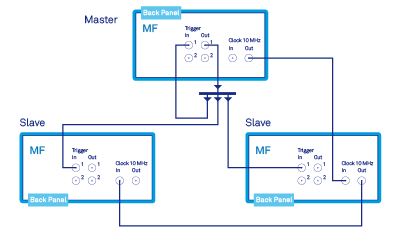 Analog output to any of the 4 auxiliary outputs on the front panel. Individual scaling and offsets can be set for each signal and the 612 kSa/s sampling rate ensures that all demodulated signal components are reliably available on the physical connectors. The signal bandwidth is the same for all signals and can be as high as 200 kHz. Transferred to the host PC over either USB 2.0 or 1 GbE and displayed on the LabOne® user interface, where they can be analyzed with one of several LabOne tools, or easily stored locally using just a few mouse clicks. Stored locally on a USB mass storage device plugged in into either of the two USB connectors.